The new BMW i8 Roadster, the new BMW i8 Coupe. The sports car of the future – now available in two body variants. New BMW i8 Roadster and new BMW i8 Coupe are under starter’s orders. Both plug-in hybrid models feature further developed BMW eDrive technology, enabling longer range and more time in pure-electric mode. World premiere of the BMW i8 Roadster at the Los Angeles Auto Show in December 2017, market launch from May 2018. 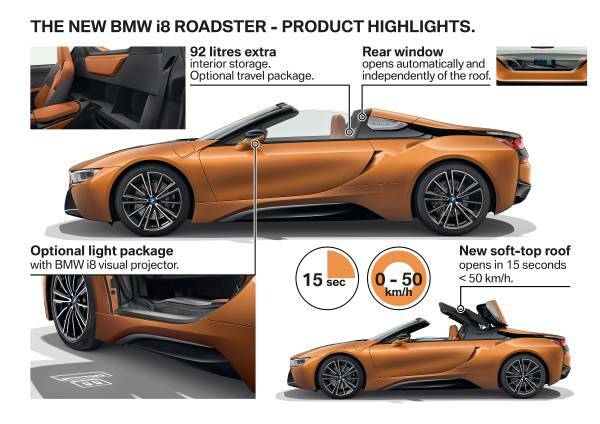 New BMW i8 Roadster represents an innovative expression of freedom: Open-top motoring in an uncompromisingly sporty two-seater, pressing the eDrive button enables virtually silent and locally emission-free driving at up to 120 km/h. Emotionally powerful exterior design with an elegantly dynamic, stretched silhouette; visually lower centre of gravity. Unique LifeDrive vehicle architecture and BMW i form language carried over into a captivating roadster concept. Model-specific body strengthening elements and gullwing doors feature the signature lightweight construction of BMW i models; windscreen frame also made from carbon-fibre-reinforced plastic (CFRP). 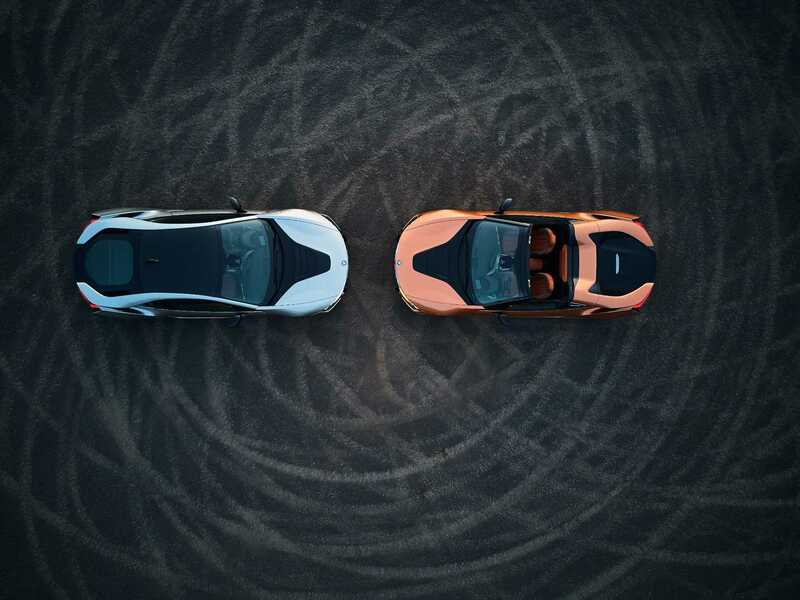 Inherent weight penalty of the new BMW i8 Roadster over the new BMW i8 Coupe limited to approximately 60 kilograms. High-quality soft-top covers a large area and has a unique mechanism. All-electric roof opens and closes very quietly – at the touch of a button – in 15 seconds and while travelling at up to 50 km/h. Soft-top stows away in a space-saving perpendicular position, creating around 100 litres of additional storage space behind the seats. Plug-in hybrid drive system with rigorously optimised BMW eDrive technology. Cell capacity of the lithium-ion high-voltage battery up from 20 to 34 Ah, gross energy capacity up from 7.1 to 11.6 kWh. Electric motor with max. output raised by 9 kW/12 hp to 105 kW/143 hp. Enhanced dynamics and markedly increased scope for locally emission-free driving. Driving with the electric motor alone is possible at up to 105 km/h (previously 70 km/h). Pressing the eDrive button pushes the pure-electric driving threshold up to 120 km/h. 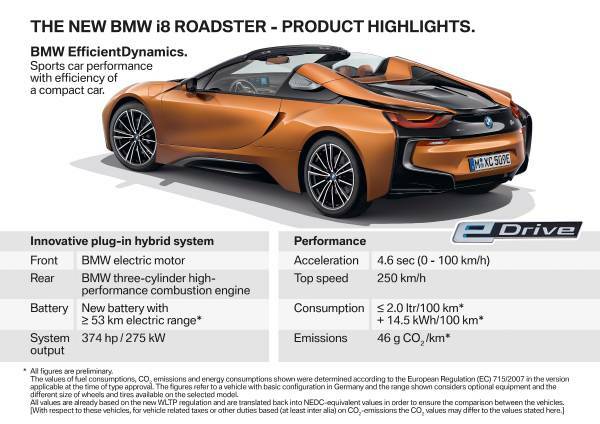 Electric range: 53 kilometres/33 miles* (BMW i8 Roadster), 55 kilometres/34 miles* (BMW i8 Coupe). Three-cylinder petrol engine has an unchanged output of 170 kW/231 hp. Engine acoustics and emissions optimised with integrated particulate filter. Combined petrol consumption: 2.1 l/100 km * (BMW i8 Roadster), 1.9 l/100 km* (BMW i8 Coupe), CO2 emissions from petrol: 46 g/km* (BMW i8 Roadster), 42 g/km* (BMW i8 Coupe). New BMW i8 Roadster has model-specific tuning for the springs, damping and Dynamic Stability Control. Both models come as standard with Dynamic Damper Control. 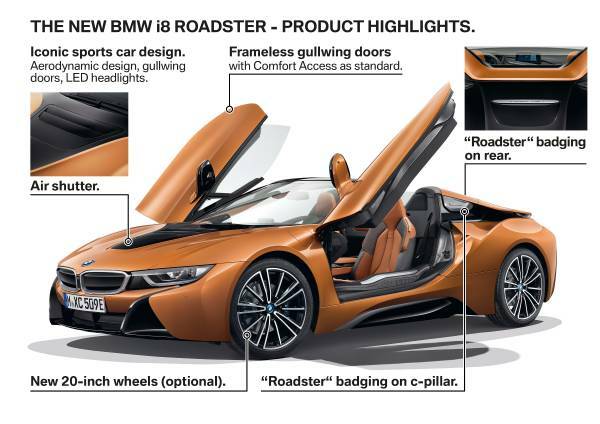 New BMW i8 Roadster fitted as standard with exclusive 20-inch light-alloy wheels in double-spoke design. Each wheel weighs approx. one kilogram less than the lightest rim previously available. 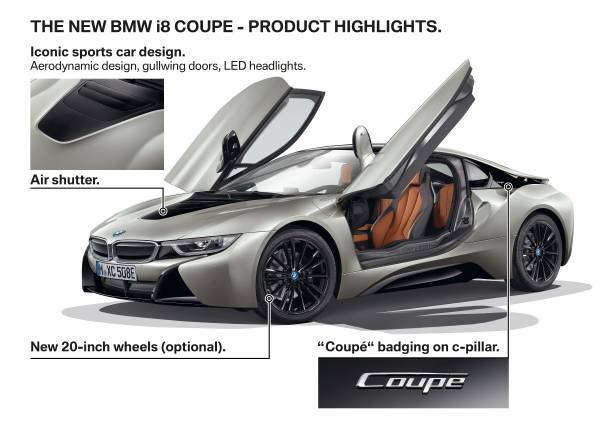 New E-Copper metallic and Donington Grey metallic exterior paint finishes for the BMW i8 Roadster and BMW i8 Coupe. 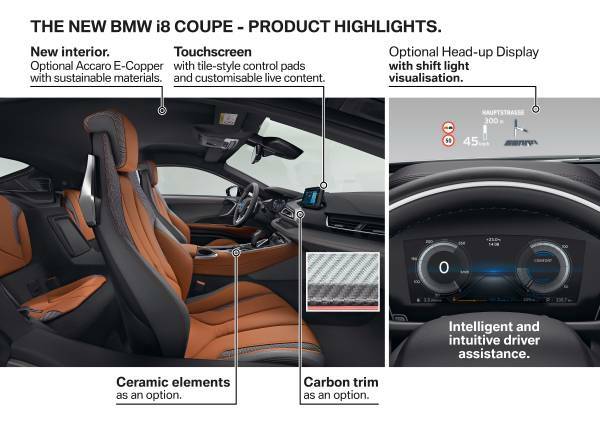 Carpo interior design is standard on both models, for the BMW i8 Roadster exclusively in Ivory White/Black and for the BMW i8 Coupe in Ivory White. New optional Accaro interior trim in Amido/E-Copper. Model-specific “Roadster”/“Coupe” lettering on the C-pillars. Standard specification for both models comprises the Navigation system Professional, BMW Display Key, Driving Assistant incl. Surround View, and a mode 2 charging cable. Tile-based menu design in Control Display, with live mode. Options include BMW Head‑Up Display with model-specific content, non-dazzling BMW Laserlight with BMW Selective Beam, and acoustic pedestrian warning. ConnectedDrive Services come as standard. BMW Connected personal mobility assistant enables extensive connectivity between the car and the customer’s digital lifestyle. New digital services include intelligent route planning (complete with refuelling stops at a charging station or filling station), sharing of the current trip status and highly personalised in-car displays. 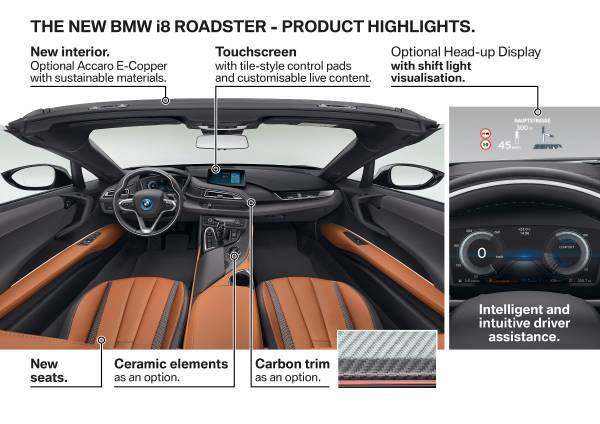 BMW i8 Roadster: BMW eDrive technology with hybrid synchronous electric motor, max. output: 105 kW/143 hp, max. torque: 250 Nm (184 lb-ft). Three-cylinder petrol engine with BMW TwinPower Turbo technology, capacity: 1,499 cc, output: 170 kW/231 hp, max. torque: 320 Nm (236 lb ft). Hybrid-specific all-wheel drive, combustion engine driving the rear wheels, electric motor driving the front wheels. Acceleration [0 – 100 km/h]: 4.6 seconds, top speed: 250 km/h. Electric power consumption, combined*: 14.5 kWh/100 km, petrol consumption, combined*: 2.1 l/100 km, CO2 emissions, combined*: 46 g/km. Electric range: 53 km (33 miles)*. 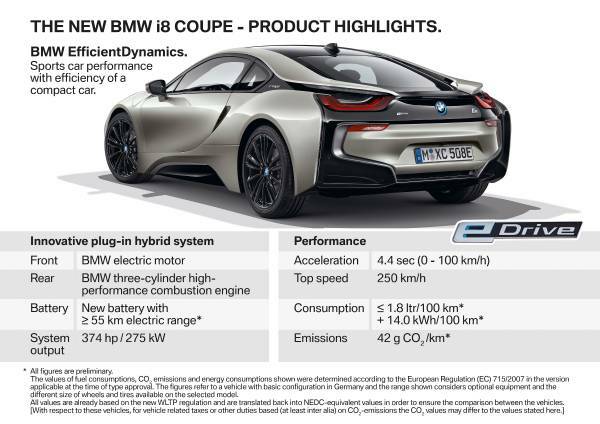 BMW i8 Coupe: BMW eDrive technology with hybrid synchronous electric motor, max. output: 105 kW/143 hp, max. torque: 250 Nm (184 lb-ft). Three-cylinder petrol engine with BMW TwinPower Turbo technology, capacity: 1,499 cc, output: 170 kW/231 hp, max. torque: 320 Nm (236 lb-ft). Hybrid-specific all-wheel drive, combustion engine driving the rear wheels, electric motor driving the front wheels. Acceleration [0 – 100 km/h]: 4.4 seconds, top speed: 250 km/h. Electric power consumption, combined*: 14.0 kWh/100 km, petrol consumption, combined*: 1.9 l/100 km, CO2 emissions, combined*: 42 g/km. Electric range: 55 km (34 miles)*. All figures relating to performance, consumption, emissions and range are provisional. *The fuel consumption, CO2 emissions, power consumption and operating range figures were determined according to the European Regulation (EC) 715/2007 in the version applicable. The figures refer to a vehicle with basic configuration in Germany and the range shown considers the different sizes of the selected wheels/tyres and the selected items of optional equipment. Further information on official fuel consumption figures and specific CO2 emission values of new passenger cars is included in the following guideline: 'Leitfaden über den Kraftstoffverbrauch, die CO2-Emissionen und den Stromverbrauch neuer Personenkraftwagen' (Guideline for fuel consumption, CO2 emissions and electric power consumption of new passenger cars), which can be obtained free of charge from all dealerships and at https://www.dat.de/en/offers/publica...nsumption.html. BMW i8 Roadster: combined fuel consumption 2,1 l/100 km; combined electricity consumption 14,5 kWh/100 km; combined CO2 emissions 46 g/km. BMW i8 Coupe: combined fuel consumption 1,9 l/100 km; combined electricity consumption 14,0 kWh/100 km; combined CO2 emissions 42 g/km. (Calculated in the EU test cycle, in combination with standard tyres).